Have you been wanting straighter teeth, but have been wondering, “Is Invisalign worth it?” The answer is yes! At our Philadelphia practice, we’ve had great success transforming smiles and lives with the Invisalign straightening system. If you are ready to say goodbye to crooked teeth and hello to a show stopping smile, the team at David Spilkia Family & Cosmetic Dentistry is ready to help. Straight teeth are important for several reasons. Naturally, many people feel like the number one reason is to improve the appearance of the smile. While this can improve confidence and even success, there are other reasons that are important as well. Straight teeth allow you to bite and chew correctly. They are also easier to brush and floss, which means your teeth and gums will be healthier. While all of this sounds great, many patients are hesitant to wear metal braces, especially adults. Luckily, the team at David Spilkia Family & Cosmetic Dentistry offers Invisalign. 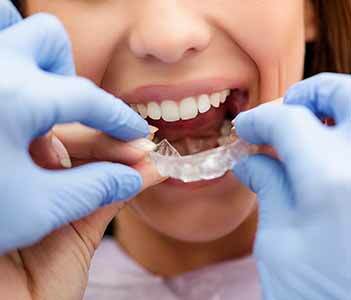 Invisalign is a series of aligner trays that are worn over the teeth to gradually move them into proper alignment. Every two weeks, a new set of aligners is put on the teeth until they reached the desired position. Depending on the complexity of the treatment, Invisalign can take anywhere from 18-36 months. The number one benefit of Invisalign is that it’s discreet. The clear aligners are virtually invisible to others. Additionally, Invisalign trays are removable, which allows you to eat, and then clean your teeth with ease before putting them back on. During the consultation process we will evaluate the teeth to determine if a patient is a good candidate for Invisalign. Some serious cases of misalignment may not be effectively corrected with Invisalign. If you are in the Philadelphia area, contact David Spilkia Family & Cosmetic Dentistry to schedule a consultation for Invisalign.